One of Britain's greatest industrial designers, David Mellor is probably best known for his sculptural cutlery, which was the first stainless steel flatware to be mass-produced in the UK. But even those who've added his spoons to their wedding registry might not know about the system of street furniture he designed, which became iconic on British sidewalks. As a wee college grad in the 1950s, Mellor approached the British company Abacus about designing a steel-framed streetlamp. It was a move that was an aesthetic departure from the traditional, overly ornate lamp posts, but it was revolutionary for the city as it utilized new, more durable materials. 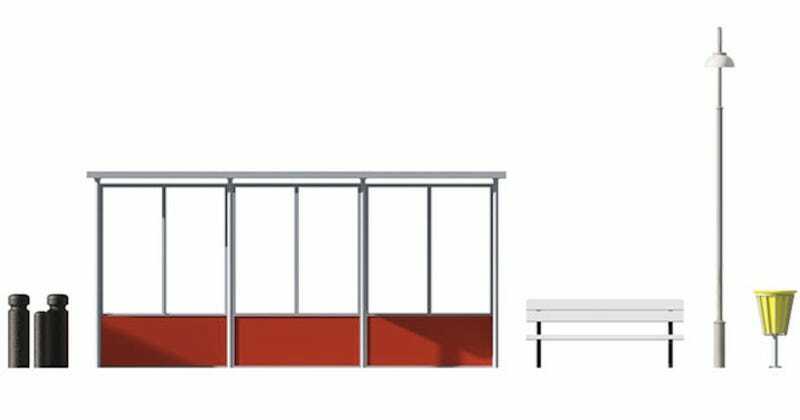 This began a long relationship with the company as Mellor designed more street lighting, bus shelters, benches, and trash bins for a rapidly changing country. It's estimated that over 140,000 of his bus shelters can still be found throughout the UK. In 1966, he also famously—and somewhat controversially—redesigned the Royal Mail's post boxes from a cylindrical pillar to a more contemporary square volume. But here was a time when form triumphed over function: His new shape was proven to be more efficient for postmen to use, yet due to public outcry for the old version to remain, only a few thousand were installed. Mellor made perhaps his biggest mark on the streetscape with the traffic lights and pedestrian signal boxes he designed in 1965, heralding a new modernized national system. Many of these are still found on London streets, not only keeping pedestrians safe but also making them feel like they're wanted and welcome, not second-class citizens to cars. That's the real beauty of Mellor's work—it truly does elevate the experience of street life. So much of the street furniture out there has dissolved into ugly, utilitarian urban drivel, slathered in anti-graffiti paint and protruding plastic to prevent you from getting too creative or too comfortable. Mellor's designs are still on the street 60 years later because they respect and honor the people who are using them. I have honestly never seen such a beautiful trash can in my life—I would totally buy that thing for my home. But doesn't it also seem somewhat appropriate that the same man who was responsible for putting functional, affordable, beautiful forks in every British hand put functional, affordable, beautiful streetlamps on every British corner? (Streetlamps: The flatware of the city. Maybe?) In an interview with Dezeen, Mellor's son Corin talked about the egalitarian philosophy of his father, who died in 2009: "He was always keen on design not being elitist but being for the masses," he said. "Good design for everybody—everybody should be able to sit on a modern park bench. It's the same process, whether you're doing something that's six inches long or sixty feet long, it's about getting the best out of the materials."